CleanMyMac has always featured bold, colorful icons and animations to let users know what’s happening at each stage of the cleanup process. However, CleanMyMac X goes further than before with shiny, translucent, gradient-heavy icons in most sections of the app. The app also has virtually no window chrome, dispensing with elements like title bars and toolbars. It’s an opinionated design that may not appeal to some. 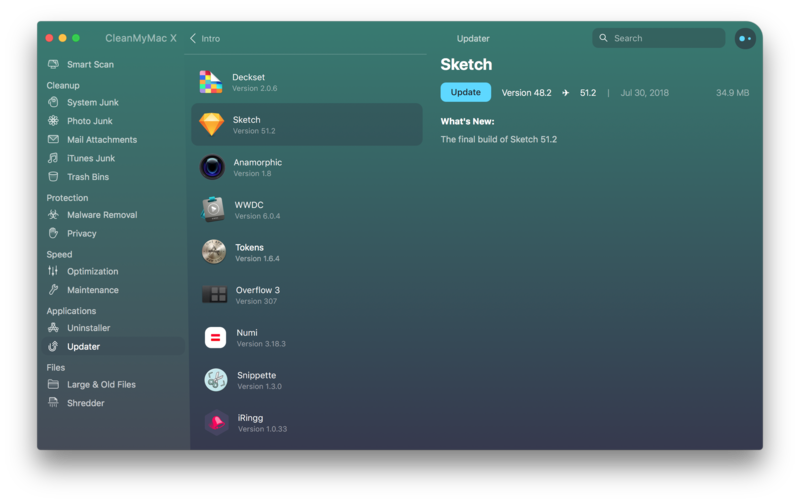 However, although the design feels like a radical departure from traditional Mac apps, it is also a natural extension of CleanMyMac 3’s design. I typically start a CleanMyMac scan, which is a one-click process, and move on to doing something else. When CleanMyMac is finished scanning, I get a notification, look at the results, start the cleanup process, and go back to what I was doing. As a result, the animations and other visuals have little impact on how I work but do provide useful feedback on what the app is doing if you prefer to keep a closer eye on it. Beyond the new look, MacPaw says CleanMyMac X finds junk three times faster than earlier versions. That’s hard to judge. The app does seem faster, but running side-by-side tests on the same Mac with the CleanMyMac 3 and X is not an apples-to-apples comparison because the newer version has moved the large files scan from its Smart Scan to a separate part of the app. In my experience, scanning large files was the slowest part of CleanMyMac 3, so removing it from the default scan makes a big difference even before tuning the app’s code. That said, Smart Scan does seem faster. CleanMyMac X's app updater module. There is new functionality in CleanMyMac X too. The app has added an updater module that scans your installed apps for available updates. It's a great way to see all the apps on your Mac that have updates regardless of whether you bought them on the Mac App Store or not. CleanMyMac X scans for malware by default. CleanMyMac now includes a malware scanning module too. Malware attacks on Macs are no longer as rare as they once seemed, and although it’s not something I worry about much, I appreciate the quick check of my system that CleanMyMac runs as part of its default Smart Scan. The CleanMyMac menu bar app has also received a facelift. 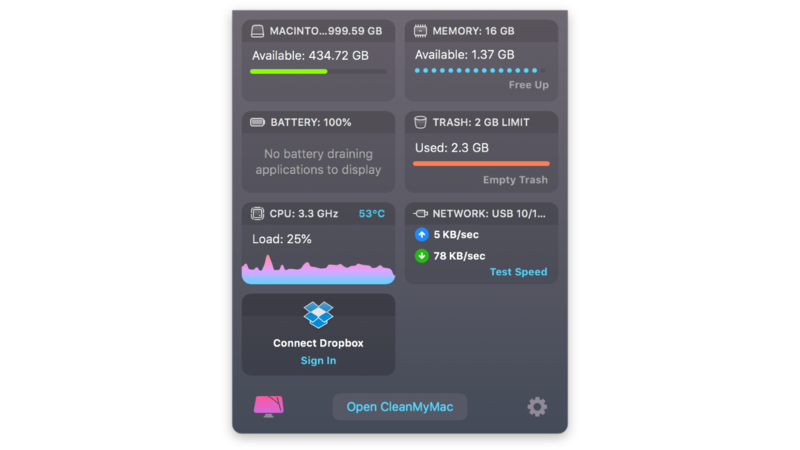 The app provides a subset of the information that can be found in macOS’s Activity Monitor or third-party apps like iStat Menus by Bjango plus the ability to run a quick network speed test, free up RAM, empty the Trash, and launch CleanMyMac. The app is a quick way to get a sense of how your Mac is performing but can be turned off in the app’s preferences if you don’t want to use it. CleanMyMac's updated menu bar app. CleanMyMac 3 users can subscribe or purchase CleanMyMac X directly from MacPaw for a 50% discount, and for the next week, new users will receive a 30% discount. CleanMyMac has worked reliably for me for years, and I’m glad to see MacPaw continue to refine it. The new features and the redesign should help broaden the app’s appeal, especially to new users, but I’m also pleased to see that CleanMyMac X is focused on the fundamentals like running its scans faster because as a utility app, that counts as much anything else as far as I’m concerned. Storage constraints are an issue for many people, especially those who use Mac laptops with small SSDs. If you’ve found yourself struggling with a nearly full Mac, check out CleanMyMac X. The app has been an excellent way to recover space with minimal effort for many years, and I expect it will continue to be so for many more. CleanMyMac X is available directly from MacPaw and as part of its Setapp subscription service.